Book lovers will be able to step outside and enjoy the fresh air while reading at Marrickville Library’s new Secret Garden. The new outdoor space officially opened today and was funded by a $60,000 grant from the Federal Labor Government’s Regional and Local Community Infrastructure Program. Included in the outdoor space is a pergola, wooden benches, a barbecue, sink, new fencing and security gates which together will help improve the reading experience for regular visitors to the library. “This is a fantastic project and unique to Marrickville. As well as providing a new space to browse and borrow, locals will be able to use the new recreational facilities for get togethers and social gatherings,” Mr Albanese said. 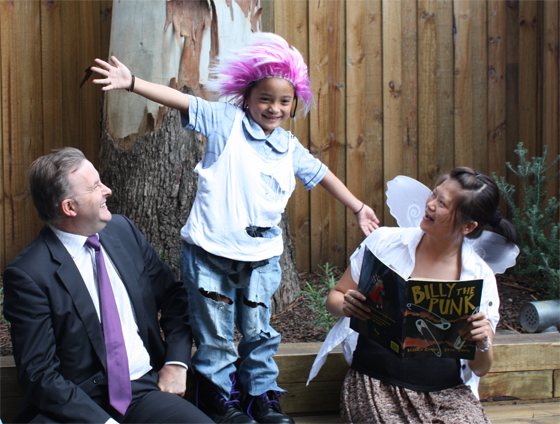 “I am proud to be part of a Labor Government that has delivered important projects such as these,” said Mr Albanese. “While the rest of the world struggled with the Global Financial Crisis, we invested in community infrastructure and jobs,” said Mr Albanese.